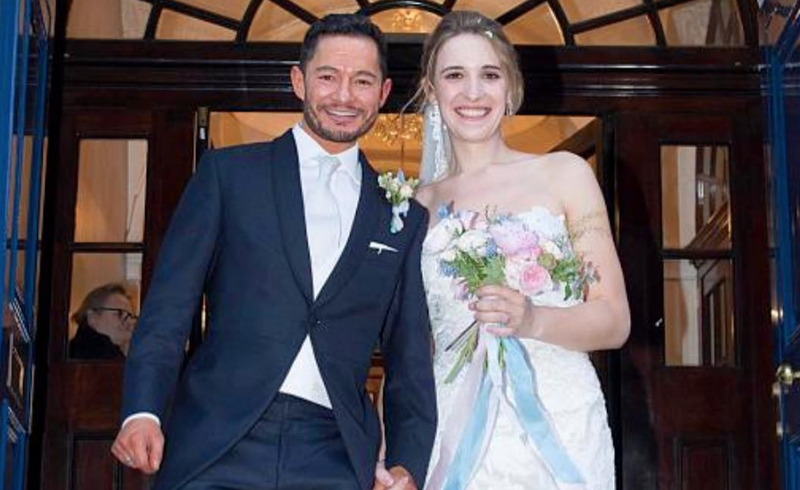 Hannah Winterbourne and Jake Graf should be celebrating their recent nuptials. Instead, they are dealing with some unfortunate headlines about their wedding. The Sun, a British newspaper, ran a feature on the married couple, who are both transgender and have transitioned so that their appearances match their gender identities. Yet, The Sun chose to run the article with some headlines about the trans couple’s wedding that the newlyweds have called “fairly offensive,” “sensationalized,” and “misleading” — and for good reason. The actual article about Winterbourne and Graf is not offensive; the couple said tthey liked it. But rather than being in tune with the article and using correct terminology to describe the newlyweds, The Sun went with a more tabloid-y headline (which isn’t that out of character for the publication). "A shame that our beautiful day and a positive article by @Emskibeat has been marred by fairly offensive headlines. I have always been a woman and Jake has always been a man." "Following such a lovely, positive article from @Emskibeat in today's @TheSun it's a real shame that it's been cheapened by such a sensationalised and misleading headline. @hannahw253 was never a man, as I was never a woman. #trans #fact"
Trans acceptance has been (and continues to be) a long struggle, so it would have been beneficial to the LGBTQ community — and society more broadly — if the headline matched the tone of the article, which fully embraced both Winterbourne and Graf for the people they are. And Graf — an actor who was featured in The Danish Girl with Eddie Redmayne — explained how he felt after his transition. “For the first time in my life I was happy to be in my body,” Graf said. Yet the newlyweds have had many people on the internet supporting them. Often it's people with small minds that write the big headlines. Disgusting, vile, bigoted, hateful, shameful. While Graf noted he faced difficulties growing up, he also said that most people don’t realize that he and his wife are transgender, which means they don’t face as much scrutiny and harassment from strangers as other trans people do. And now that they are married, they will live in the Army’s married quarters near Winterbourne’s barracks. It’s reassuring that Winterbourne and her new husband are accepted when it comes to her military service, but these headlines — and some people’s responses to them — prove that there is so much further to go. The one positive to these headlines is that they have given Graf and Winterbourne even more of a platform to advocate for trans rights. And we hope that the support they have been receiving since their Sun article came out is one of their favorite wedding gifts.